So you’ve secured an assignment via a recruitment company, but what happens next? Well, you’ll typically be offered two different pay rates for you to choose between – yes, yet more decisions! Never fear, however, as we’re here to help. Because we’re with you all the way, we can provide you with all the information you need to make an informed decision. 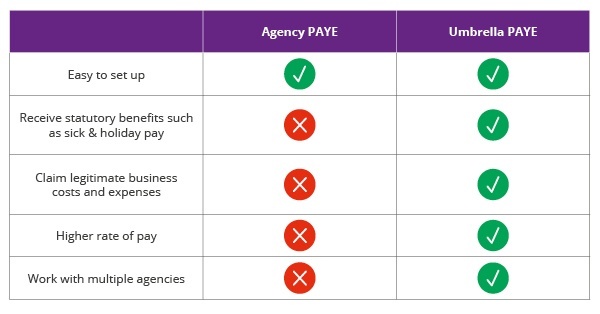 The first option is to work via an agency on a Pay As You Earn (PAYE) basis – meaning you won’t have to worry about completing tax returns. Alternatively, you’ll be given the option of joining an umbrella company, such as Parasol. As with agency employees, umbrella contractors escape the hassle of filling out tax returns – leaving them free to concentrate on their assignments. As we hope you can see, joining an umbrella company is by far the better option. Not only will you be free to work with a number of different agencies, you can also claim legitimate business costs and expenses and receive employment rights and benefits usually afforded to “permie” workers. Seems like a no-brainer, doesn’t it? Well actually, this isn’t the end of the story. That’s because these aren’t the only options available to contractors – they’re just the ones typically offered by agencies. The others involve operating as a sole trader or limited company. Don’t worry though, as we’ve created a handy guide that explains the pros and cons of all four options. Check it out here. If you’d prefer to discuss your different options with somebody, we’re here to help. Our dedicated team is on hand to provide unbiased guidance that is based on your own circumstances – so you can be sure to choose the route that’s right for you. To get the best advice, contact our team today on 0800 458 0818 or email bestadvice@parasolgroup.co.uk. Don't let pesky myths stop you from going limited. Our guide helps separate fact from fiction. Want to start your contractor career but don't know where to turn? Here are a few steps you should follow. Discover our top five tips to securing a contractor mortgage in this guide. Thinking about ditching permanent employment? Here are a few things that could persuade you to make the leap.